Google Testing Commercialized Answer Box? It’s no secret that Google wants to monetize the search results page as much as possible. So Google is always experimenting to see what parts of the SERPs can be commercialized without severely compromising the user experience. In what appears to be its latest test, Google is playing around with providing users with commercial results in the Answer Box. What Did Google Do to the Answer Box? The commercialized Answer Box appears where the traditionally informational Answer Box results would appear, and looks basically the same – except for the notable addition of a large picture of the product! This almost feels like a blend between a traditional Answer Box result and a Shopping Ad. However, there’s nothing else to suggest to users that this is a promoted result – there are currently no indicators that this is a paid placement, such as the “Sponsored” tag featured on Shopping results or the “Ad” flag seen alongside search ads. This makes sense; if Google wants to try a new ad feature, it’s easier to test it out as an organic format first, because you don’t have to sign up advertisers for the beta. 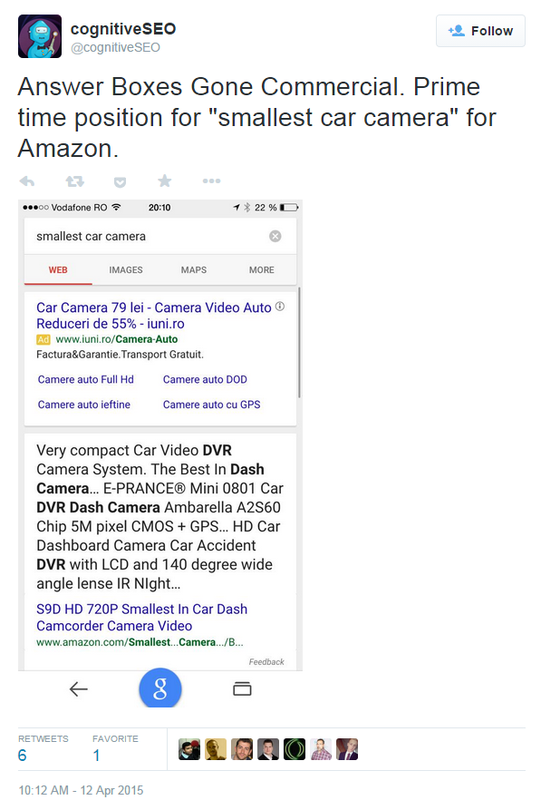 In the “smallest car camera” SERP above, we’re looking at a completely different kind of query. The answer box usually shows up on the types of searches that aren’t easy to monetize. Purely informational queries usually get mostly if not 100% organic SERPs, because the ads are waste of space; nobody clicks them. This is definitely a query with commercial intent though – in fact everything else above the fold is a paid result. If you’re a business and you’re lucky enough to score the Answer Box result for a high-intent commercial query (like “best CRM software” or “most effective sleep aid”) that could drive crazy amounts of clicks and sales – so it makes sense that Google would eventually want you to pay for that space! Is a Commercialized Answer Box Good for Users? Obviously, the commercialization of the Answer Box is good for Google. It provides them another opportunity to monetize the SERP without any drastic UI changes that could potentially upset users. Although it makes sense for Google, it could also help enrich the search experience for users. While most search queries can be categorized as either informational or transactional, there are some queries that fall into a gray area somewhere in between. Think of it as the online equivalent of talking through a potential purchase with a sales associate at a big-box store like Best Buy. Most people don’t go into an electronics store with a specific make and model of the product they want to purchase – they have a rough idea of what they want, but they might not be aware of specific features or specifications of individual products. This is a great opportunity to not only present a product that meets prospects’ needs, but also serve as an educational opportunity to help prospects learn more about a particular product. In cases like this, a commercialized Answer Box could be a great fit for queries that are both informational and transactional. 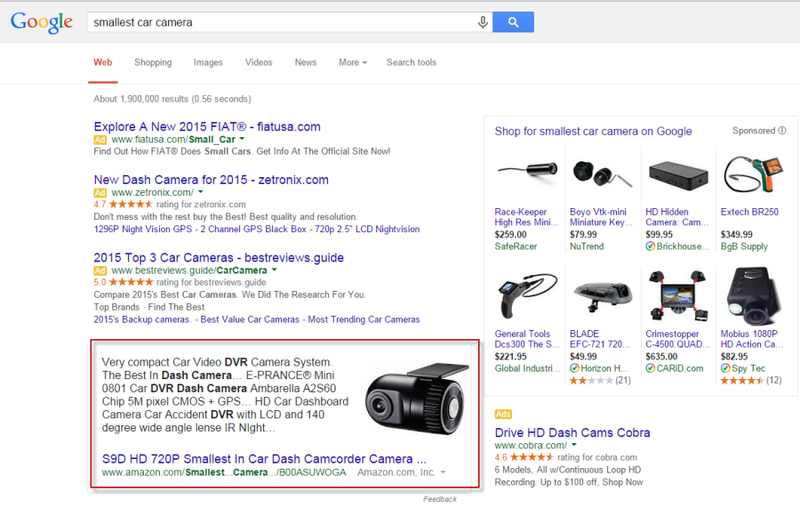 Will Commercial Answer Box Queries Become a New Ad Format? Although it’s too early to say for sure, I think we’ll see Google introduce the commercialized Answer Box as another ad format in the future. Google hasn’t been afraid to experiment with monetizing other parts of the SERP in the past. Remember when Google tested the introduction of paid local ads last year? 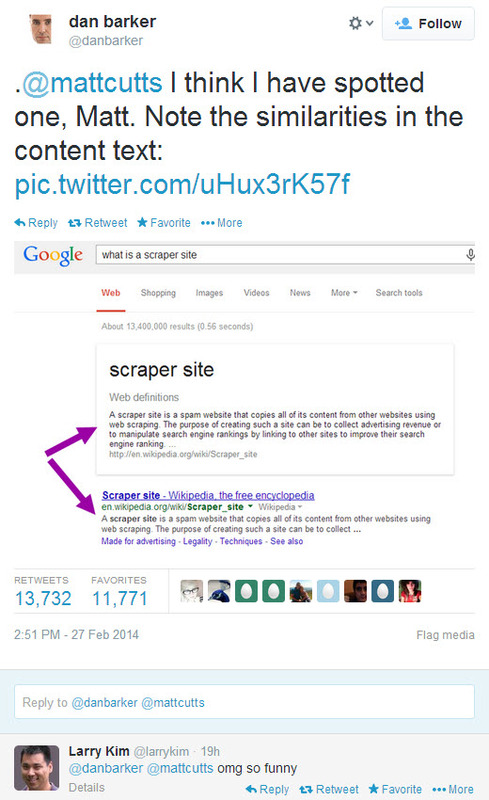 Or when they removed video snippets from the SERPs, shortly before introducing YouTube results that featured ads? Or when they took away authorship photos from search results because they were probably negatively impacting the click-through rates of paid results? I think we’ll see a lot more commercial results in the Answer Box before long. A lot of advertisers will be eager to pay for this premier real estate on the SERP, especially given how familiar users are with the Answer Box and its proximity to organic results. Of course, just as with many of Google’s tweaks to the SERPs, it’s also possible that Google will decide otherwise, but I’m willing to bet that this feature is here to stay. What do you think about the commercialization of the Answer Box? 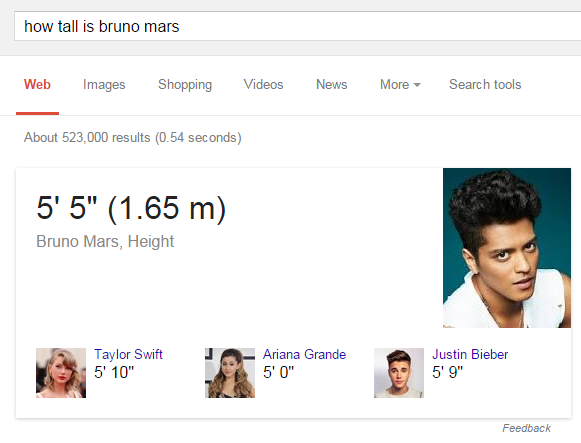 Have you been able to replicate these results with other search queries? Let me know in the comments! This article was syndicated from Business 2 Community: Google Testing Commercialized Answer Box?